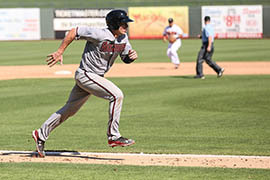 SCOTTSDALE – After posting Major League Baseball’s worst record this season, the Arizona Diamondbacks are looking toward the future at this year’s Arizona Fall League. The team’s top prospect, starting pitcher Archie Bradley, is among seven Diamondbacks playing for the Salt River Rafters, the organization’s Fall League affiliate. Viewed as potential anchor in the rotation, Bradley struggled with an elbow injury last season and is hoping to get things back on track here against tough competition. Bradley wound up compiling a 4.45 ERA and 3-7 record in stops with Triple-A Reno, Double-A Mobile and the Diamondbacks’ rookie affiliate. He walked 49 batters in 83 innings while striking out 75. In three starts with the Rafters, Bradley is 0-2 with a 10.29 ERA, walking six and striking out six in seven innings pitched. But he and his coaches are focused on other aspects of his game. Diamondbacks director of player development Mike Bell said Bradley is doing good things with the Rafters. While much of the attention is centered on Bradley’s progress, the other six Diamondbacks prospects are under a microscope as well. 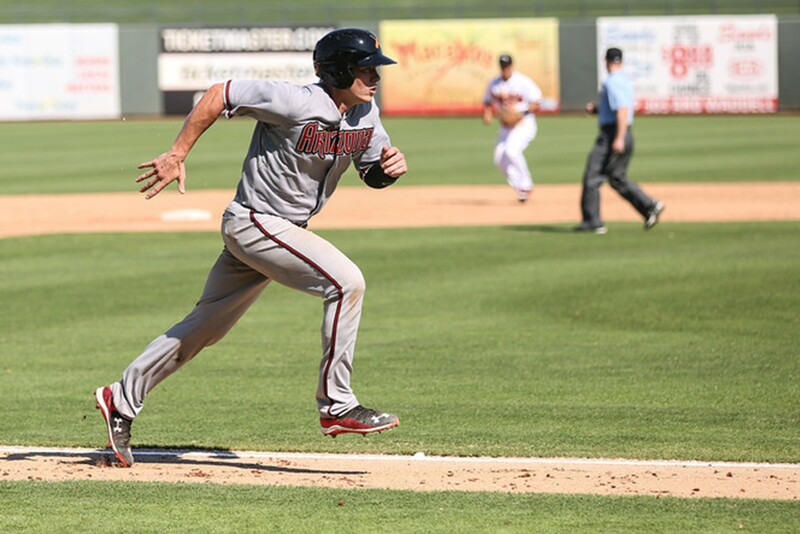 That includes catcher Peter O’Brien, rated as the Diamondbacks No. 7 prospect by MLB.com, who has turned heads with three home runs and seven RBI with a .449 on-base percentage in 11 games through Thursday. Standing 6-foot-3 and well over 200 pounds, O’Brien has the build of a slugger. He came to the Diamondbacks in the trade that sent Martin Prado to the New York Yankees after hitting 33 homers between High-A and Double-A. O’Brien has played first base and catcher in the minors, but with Paul Goldschmidt entrenched at first base the Diamondbacks project him as a catcher. O’Brien has played some games at first base and designated hitter for the Rafters, but Bell said O’Brien’s ability to play catcher, retain a game plan and be an offensive threat have the Diamondbacks excited. Diamondbacks pitchers Bradley, Enrique Burgos, Kaleb Fleck and Jimmie Sherfy are throwing for the Salt River Rafters, O’Brien, third baseman Brandon Drury and outfielder Evan Marzilli are in the field. Playing for the Rafters through Nov. 13, these top-level prospects suit up for six games per week, hoping to show scouts why they deserve a shot at the big leagues. According to the Fall League, almost 60 percent of participants end up in the majors. Bell said every Diamondbacks player in the Fall League should think he will be one of players to make it, and for good reason. The Diamondbacks have some new faces in management after their underwhelming season, starting with Chief Baseball Officer Tony La Russa. The newly created position gave La Russa the authority to evaluate Arizona’s entire operation. Since coming aboard, he fired manager Kirk Gibson and demoted General Manager Kevin Towers, who later left, and brought in Chip Hale and Dave Stewart as the new manager and GM. Bell, who has been director of player of development since 2010, said the changes could affect how the organization evaluates its prospects. Peter O'Brien, a catcher in the Arizona Diamondbacks minor league system, is off to a fast start in the Arizona Fall League. O'Brien joined the franchise in the trade that sent third baseman Martin Prado to the New York Yankees.